Rice genetically engineered to be resistant to glufosinate (developed by Bayer CropScience) has been approved (deregulated) in the US but is not yet for sale commercially as the company attempts to get approval in countries which import rice from the US as well. As far as I know, no company in the US has produced bt rice, which has less to do with consumer fears than with the small amount of rice production in the US rather than consumer rejection, but that’s just a guess. The Chinese government has developed breeds of bt rice, but doesn’t grow them commercially because of the risk to their export markets, which is primarily to countries that reject genetic engineering (although Chinese rice exports are declining drastically as more and more of their production is needed to feed their own people). 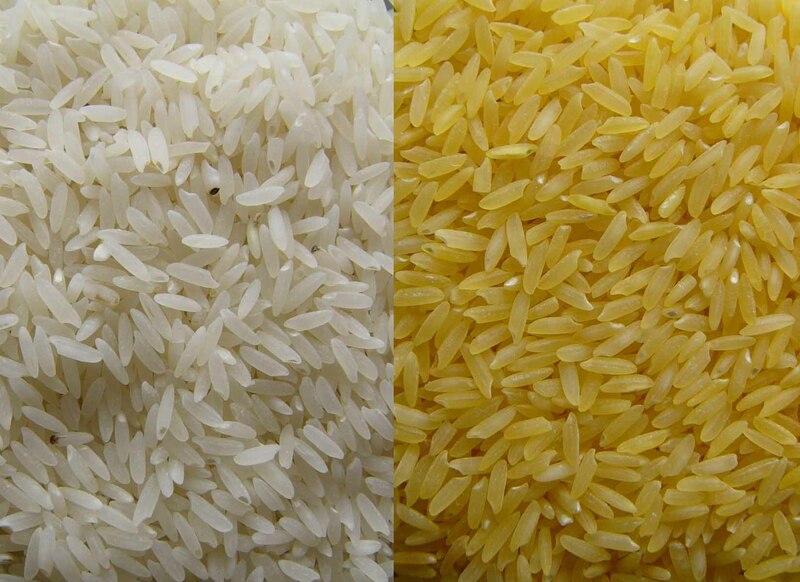 Golden rice, which has betacarotene, which human bodies need to make vitamin A, was developed by in Swizerland in the 1990s. Almost all plants produce carotenoids like betacarotene in their leaves as part of the biological machinery that makes photosynthesis possible. Breeders can sometimes identify and propogate natural mutations which lead to the expression of carotenoids in other parts of the plant, two key examples are orange carrots* and orange cauliflower. Vitamin A deficiency is a major issue** in many countries were rice is the primary crop, so breeders have searched for decades for natural mutations at would create orange rice, without success. 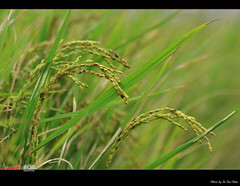 *** The initial breed of golden rice which used two genes, one from daffodile to promote the expression of carotenoids in the grains of rice was attacked as requiring people to eat more than a dozen bowls of rice a day to get their daily recommended vitamin A intake, new versions that replaced the gene taken from daffodil with a version of the same gene taken from corn have more than twenty times as much beta carotene. Golden rice is also not currently grown commercially as it, like ringspot resistant papaya, doesn’t have a powerful for-profit corporation to shepherd it through the complex approval processes of various nations. Where to begin. Of the crops that feed the world, rice is indisputably first. Cultivated for more than 10,000 years, toay more than 1/5 of all calories consumed by humans across the world come from rice. In my one year studying Hindi, I remember the fact that the word same word meant “rice” or “food”, stuck in my head. That’s how important rice can be. Rice actually falls into two subspecies, indica and japonica, grown in different parts of Asia, and I’m told people can actually taste the difference. Beyond that primary distinction there are thousands of individual cultivars of rice with their own distinctive shapes, scents and flavors. 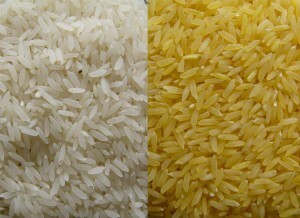 In the right store you can even find red and black rices. I personally want to find some of the black kind (actually really dark purple), both because it gets its coloration from anthocyanin, my favorite plant pigment, and because who doesn’t want to try something marketed as “Forbidden rice”? *The first carrots domesticated from the wild plant Queen Ann’s Lace were white, and you can still find such carrots. Breeding created the orange carrots we enjoy today (which I’m told have gotten noticiably darker as breeders continue to improve their betacarotene content), as well as purple carrots (anthocyanin) and red carrots (lycopene). **A quarter to a half a million children around the world go blind from lack of vitamin A every year. Many die soon-after. ***When I mention breeding was unable to accomplished one thing or another, that’s not a dig at plant breeders. They have and continue to work miracles every year. The point I’m trying to make is that genetic engineering is a tool that we can turn to when we face those few situations where conventional (and marker assisted) breeding is ineffective. Posted in: agriculture, Crop Profiles.